You are currently browsing the tag archive for the ‘traffic accident’ tag. I was driving from Sydenham the other day & saw a stretch of new tree plantings along a particularly barren section of Marrickville Road just where the road curves and before the left hand turn into Fraser Park. Many holes have been cut into the concrete footpath & young trees have been planted. So today, during a break in the rain, we went there to take some photos to add to this post. We were walking along discussing the new trees & the wonderful planting done above our heads along the goods train line when a car mounted the footpath crashing into one of the newly planted trees right in front of us. The car, which was travelling about 50km/hr, only stopped because the stakes that were bracing the sapling was sufficiently strong enough to act as a bollard. If the car had been going any faster or had hit the footpath at a different angle, we would have been knocked down or pinned between the car & the brick wall of the goods line. In a moment, a post about new tree planting became a post about how tree planting saved us from serious injury & perhaps death. This event clearly demonstrated that street trees do actually keep pedestrians safer by forming a barrier between the pedestrians & passing vehicles. Research has also shown that drivers slow down if there is a significant canopy overhead because they perceive the road as smaller. Less speed means less accidents & less damage if there are accidents. I think most people would agree that street trees are more beautiful than bollards or steel barriers. 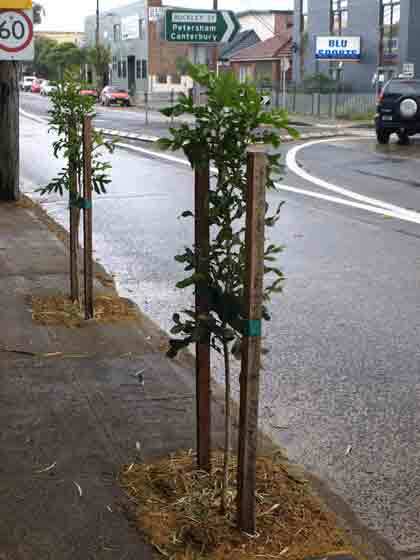 If the right species of tree are planted, street trees provide food & homes for birds & small native animals. Their shade also prolongs the life of road surfaces & footpaths though I acknowledge that the roots of trees, especially older trees, can lift concrete footpaths. This is easily dealt with by not concreting so close to the tree & by replacing concrete with permeable footpath material near older trees. Councils on Sydney’s North take this option routinely, rather than remove their large trees. Back to Marrickville Road. The sapling itself is miraculously unbroken. It just bent over with the stakes as the car hit. We did the best we could to reposition both the sapling & the stakes, but the stakes could do with being hammered in & made strong again. The car was able to drive away & didn’t sustain too much damage, though I think driver & passenger were quite shocked. I think we all left thinking the whole incident could have been far worse. 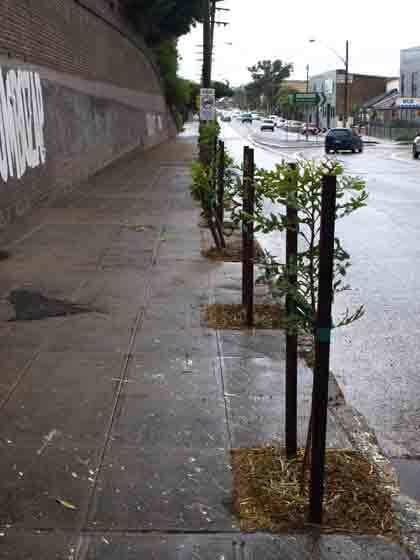 Marrickville Council has planted 11 trees in this section. I think they are Firewheel trees. A little further along they have planted another 2 trees & it appears they intend to plant more trees as the space is certainly available. Cutting out holes in concrete is a big job so I am not surprised they have not completed the job. This area will look lovely when the trees have grown. It is an ugly area of Marrickville so it will certainly benefit from a greener outlook. I hope Council intends to do both sides of this section of Marrickville Road as well as the area near the bridge at Sydenham & nearer the railway line. The Firewheel tree is a native of both QLD & Northern NSW. Interestingly, the Los Angeles Department of Recreation & Parks describes the Firewheel as a fragile tree as well as a heritage tree. They say “Preserving these treasures is important for future generations to admire.” I like their attitude. For tree lovers, the Firewheel (Stenocarpus sinuatus) is a rainforest tree. It can grow up to 30 metres in rainforests, but in gardens it grows up to 6-10 metres. It has a 2-3 metre canopy making it easy to see why Marrickville Council likes it. Being a rainforest tree it does need water, especially while it is growing. I noticed that, unlike Ashfield Council, Marrickville Council does not add a watering pipe down to the roots when planting, nor have I seen Council workers watering street trees. Perhaps residents can water trees outside their homes, especially in summer when they can become stressed. The Inner West Courier newspaper published another letter about the Mackey Park Figs on 29th September 09. You can read it by going to the ‘Media articles’ page which can be accessed in the left hand column on this site.